In most cases we are decorating on a budget. Few of us are lucky enough to have unlimited spends when it comes to our home decorating dreams. Remember that essentials list you made? Well now is the time to prioritise that list. When looking at your decorating budget you will be able to prioritise that list, and you will unfortunately find that some things will have to be put on hold. 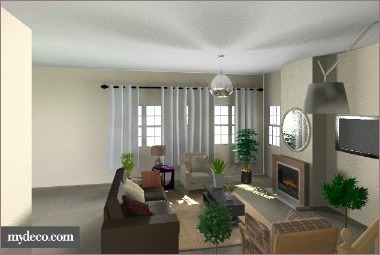 If you are realistic about your budget, you can create a lovely home that is within your price range. The worst thing is to leave your home looking like a construction site until “one day” when you win the lottery! First things first, the budget: as many financial planners will tell you, a budget is a necessary tool in figuring out what you do with your money each month and where you can make changes. Basically, you will tally up your income and deduct your expenses and you are (hopefully) left with a surplus of money that you can use. If there’s not a great deal of money left over, then look at your variable expenses (those that change each month) to see where you can make adjustments and save. Sometimes, the only way you will ever buy more than a cushion is to take out a loan. In this case your budget will tell you what the amount of the repayments are that you can afford, so you know how much to apply for. Plan well, and spend your money wisely. Remember that you will take years to pay off the loan - so make sure the decorating choices you make will keep you happy for those same years. Before doing any actual decorating on a budget, be sure to investigate furniture stores, hardware stores and other places for prices. 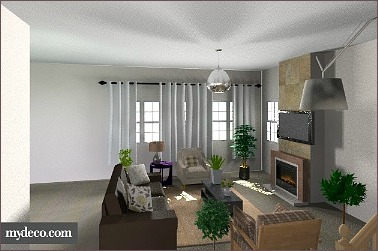 After all, it helps to know what your money will buy you so that you can plan your decorating or renovating properly. If you need to use contractors then get plenty of quotes, and ask for recommendations from friends or colleagues who have used contractors. Even if you do need to use a contractor, it’s still a good idea to have an idea of what is involved on the technical side so that you understand the quote and won’t get taken for a ride. Whatever final price estimate you arrive at, be sure to add an extra 15% or so, for unforeseen costs. Another option is DIY. If you are handy, you can save a bit by doing a lot of the decorating preparation yourself. Personally, I feel that it’s also very rewarding to do things yourself. Once you have decided on what items on your list will be done, reorder the list so that tasks are completed in a logical order - for example, do your painting before getting your new furniture in. 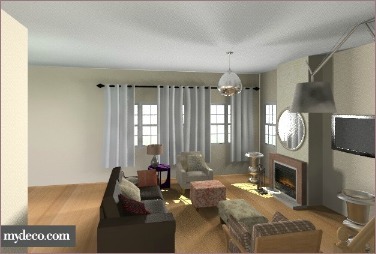 Here is my rendered living room - this is a living room that has already been decorated in a certain style, but I would like the style to be more like the inspirational picture above. I’ll show you the changes I would make to echo the look of the first picture on the different budgets available to me. The first thing I would do is create a feature wall either with paint or wallpaper. I chose to do only the chimney breast in wallpaper to keep cost down. The rest of the walls were painted. 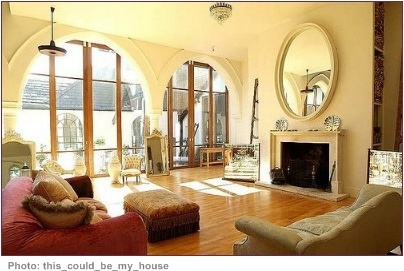 The feel of the inspirational picture is echoed by the mirror (a splurge item) and the cushions. Here I make the same changes as the small budget, but also have a laminate floor installed in the same honey shade as my inspirational picture. I’ve further echoed the feel of my picture by adding ottomans in that style as well as some large accessories and fireplace tools. Once again, I make the same changes as on the medium budget. I also add two console tables - a mirrored one (left) and a painted wood one below the TV. 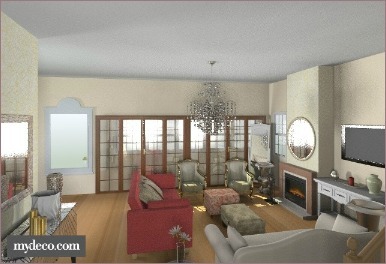 I add a few large mirrors as they are a primary feature in my decorating picture. I splurge on a new armchair and love-seat similar to the style of furniture in my picture. 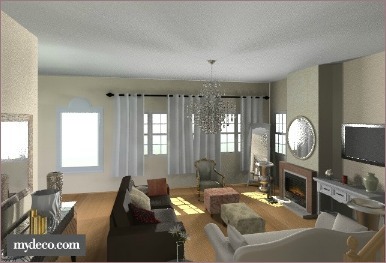 I add a large chandelier and also a few more accessories (mainly vases and candles). Same changes as above; Then I have the windows converted to wooden doors. I wallpaper the wall opposite the chimney breast to tie the space. The brown leather sofa gets replaced with a red one (as in my inspirational picture) with some cushion updates. I also add another matching armchair. These pictures are just to give you an idea of how much or how little of a style to implement depending on the available funds. When decorating on a budget, you need to be careful that your room still retains harmony after the changes.